The rugged Goat Wall – with its massive icicles strung down its surface, like granite Christmas tree – looms over my trail as I cross-country ski over a snow-covered bridge. Below is the glacial-carved Methow River, its waters flowing below ground. On the other side, naked cottonwood trees stand guard. The snowstorm blowing around me worsens, making it difficult to see the trail that's already dark, hemmed in by lovely Western red cedar and birch trees. 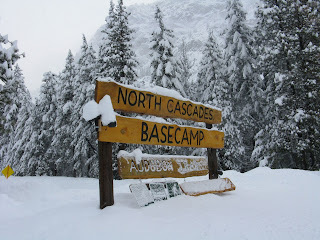 I'm on my way to the North Cascades Basecamp, a simple lodge turned ecology center that will become my most favorite accommodation in the Methow Valley, an unspoiled part of Washington state (it's four hours northwest of Spokane) and one that's renown for its network of well-groomed cross country ski trails. Once inside, I gravitate to a cozy niche: a sunken lounge space in one corner of the living room with an expansive bay widow, thick carpeting and an amber-glowing wood burning stove. 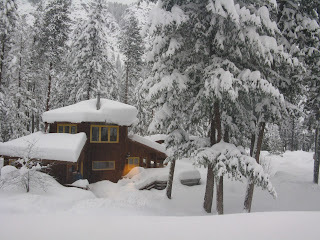 As I snuggle up with a cup of mint tea, I spot skiers gliding past the Douglas firs and Ponderosa pines outside. Then I wander to the myriad bookshelves and select a tome on birds in winter. The vibe is calm, warm and welcoming. So much so that I find it difficult to get back on my skies for another 13 km before dinner. Each of the six rooms in the main lodge – there are also cabins – are given regional names: Goat Wall, Rendezvous (a much loved nearby hut-to-hut trail system), Mt. Gardner (an almost 10,000-foot peak), Becky (a well-respected climber). I decide on Pasayten (a wilderness area) on the second floor with its queen size bed and large adjoining bathroom. By the morning, the new fallen snow has crawled up to the base of my second floor window! Everywhere I look, I find local artwork hung on the walls, including a lovely landscape mosaic of stones in the dining room that's set for family-style meals. That evening, I sit around one of the long wooden tables along with two couples who are ultra-marathoners and the proprietors. The tangy goat cheese spread appetizer is straight from the nearby dairy. Then, we dig into the Africa spicy stew that's thick with squash, chickpeas, peanuts, tomatoes; a leafy salad and beets. Kim and Steve Bondi, the new owners -- they're both wildlife biologists -- of this property, have upped the sustainability (and educational) factor by raising bees for honey, planting a herb and vegetable garden (their menus incorporate everything from homegrown cilantro to spinach), and leading naturalist tours. 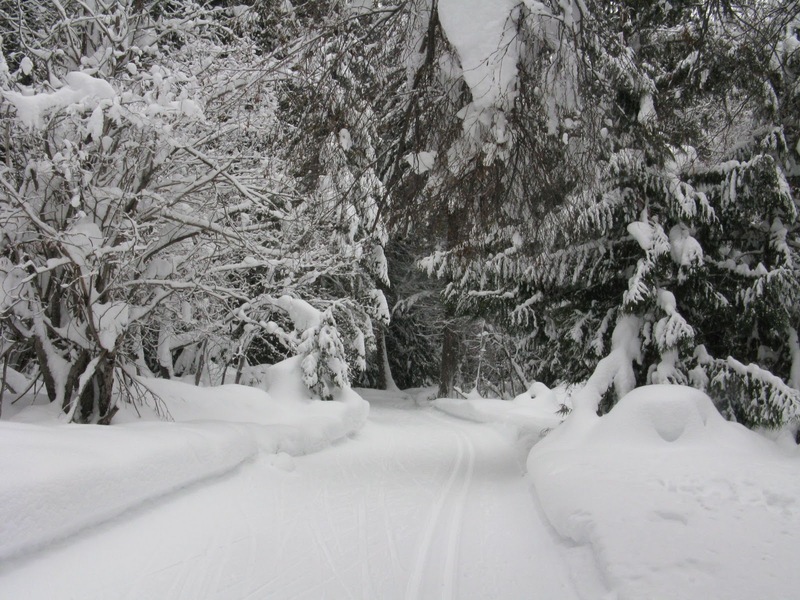 Every Saturday morning in the winter they bring in a naturalist who leads a two-hour complimentary snowshoe tour through the woodlands. During the year they also host other programs, including animal tracking, art illustration in nature and a migratory bird festival. Their upcoming watercolor class in mid-February with noted painter John Adams is especially tempting. Thursday is Bread & Soup night + an environmental presentation with experts in the field. It's a great time to mingle with the community -- and the Methow Valley has community spirit aplenty. And dozens show up each week. If the topic happens to be wolves, close to 100 people may pack into the wee room. This night -- we learn about the elusive lynx in the boreal forests -- I sit at a table sipping a flavorful potato, spinach and garlic soup along with two of the men who produced the goat cheese that I enjoyed the night before. 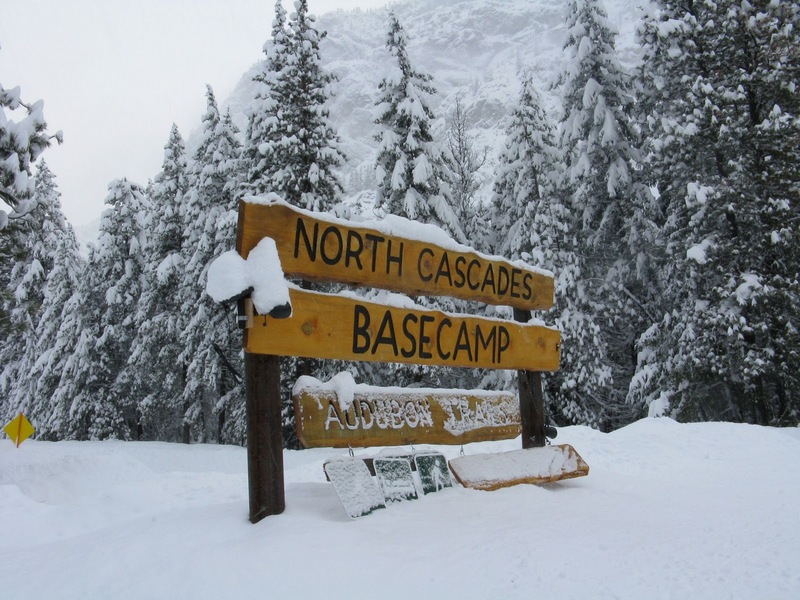 At the North Cascades Basecamp, even the basement warming hut -- the focal point of the presentations -- beckons the skier: a stove is kept burning, hot chocolate and apple cider are available as is the ultra fresh Mazama water, and gourmet chocolate truffles (also from Mazama). There are plenty of eco lessons to be learned by reading the posters on the walls: how to distinguish lynx tracks and how the black-capped chickadees survive in winter. The next morning, after a breakfast of homemade pressed apple cider, locally roasted coffee (organic and free trade) as well as a filling bowel of porridge consisting of farro, rye and flax, I'm not happy to be leaving the Basecamp. I know I'll my room with its snow coated forest views, the healthy wholesome cuisine, the sun splashed living room, and the friendliness of Kim and Steve Bondi. I'll just have to return, soon. 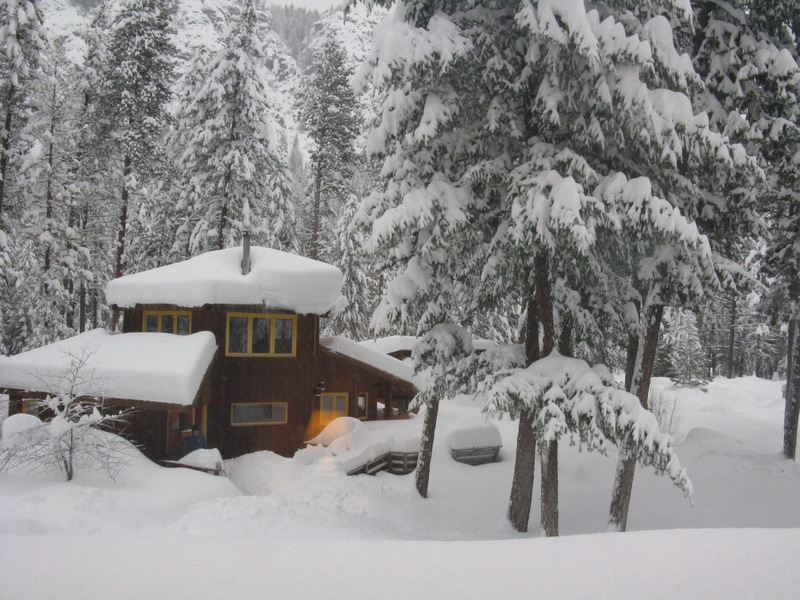 The Methow Valley is a spectacular place to visit (or live) year round! Mazama has such a beautiful, peaceful and inspiring essence to it. Kim and Steve embody this energy with all that they do at the Basecamp, making it a truly welcoming place to stay while you explore the surrounding landscape. 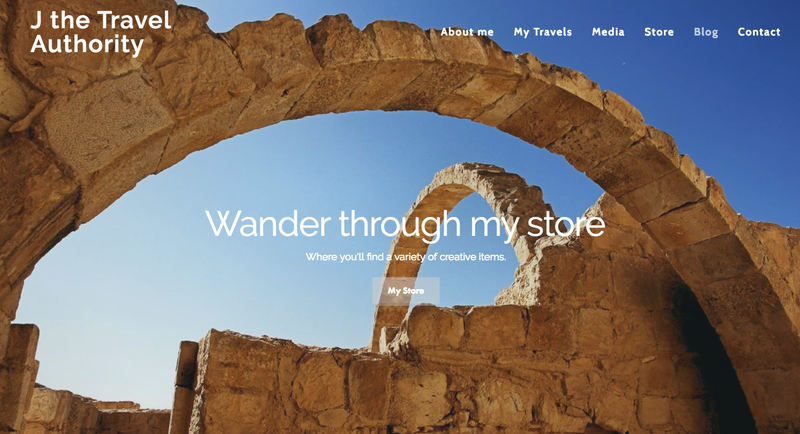 What a beautiful review you share here. Your words are poetic and I can feel your peace within them! This sounds like an amazing place! I love that the new owners are eco-friendly. Hi dowhatyoulove, Thanks. Glad you enjoyed my post. It's such a special place, I can't wait to return. HI Alexandra, Yes, the eco-friendly factor is definitely a major plus for me, too. This looks lovely. We've had such little snow this year, I'm actually itching for a good snow storm. Hi MyKidsEatSquid, The Methow Valley was lacking snow as well. They hadn't had a great storm for awhile. And then, the day after I arrived they're hit with 15". Perfect! So beautiful. I love the snow, and good thing, since I live in Michigan. Wow. Gorgeous. 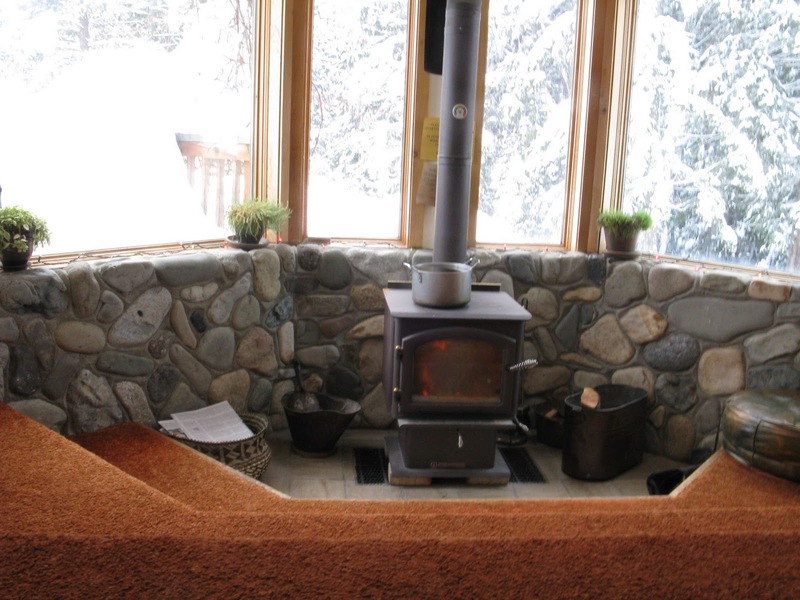 I am not a skier but I am a sitter-in-lodges-and-read-alot type and this looks like the perfect place for that as well. Hi Jane, I only like snow when it's fresh and pristine and when I can play in it. In NYC, snow is often one big pain in the neck. Hi merr, my friend is not a cross country skier either and I'm thinking of returning here to he can hang out in the lodge while I'm skiing. It's a great place to relax. Gorgeous. A cozy fire, a blanket, and a snow-covered view like that (ok, and a mug of hot tea) is my idea of heaven. Hi Casey, What could be better? Looks like the place I want to be right now, surrounded by snow but at the fireplace having a wonderful wine! Hi Kris, Thanks for adding it to your Pinterest board. And I hope you make it out there. It's a delight. Hi Dona, A glass of wine by the fire sounds good to me.